Well over the Christmas season I picked up two new guitars. Nothing fancy just good ole players. This one is a guitar made by my two sons music instructor. 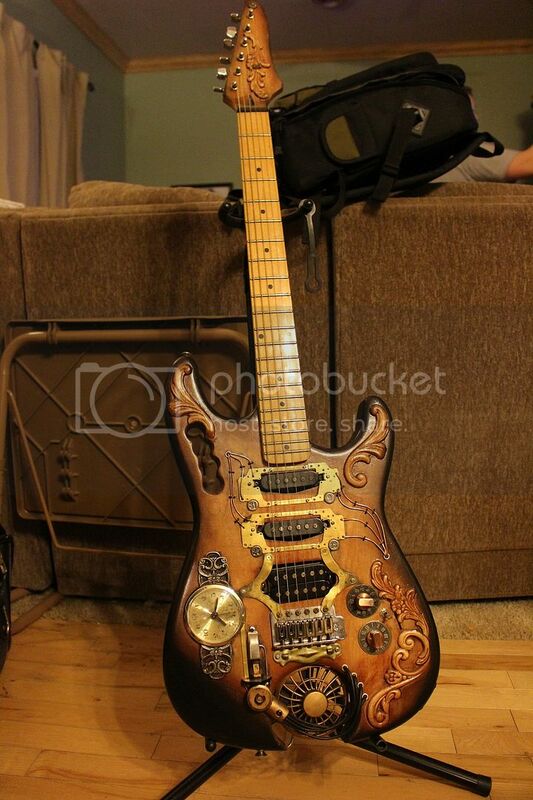 He has made a lot of steampunk guitars recently. This one just caught my eye. It plays and sounds great too! 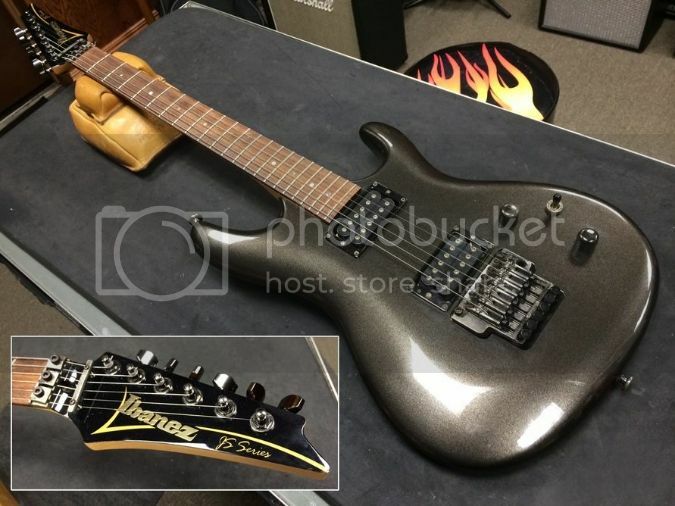 I ran across this one and got one heck of a deal as it has a hair line crack below the bridge in the clear cost finish. 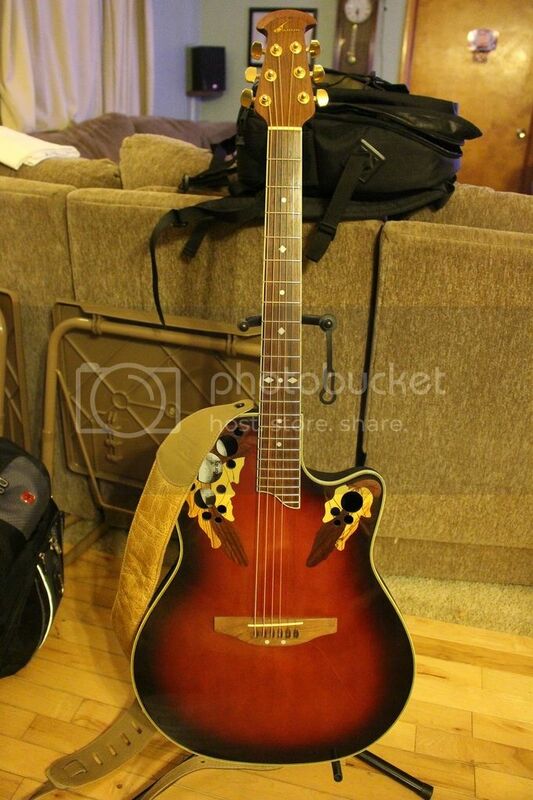 Came with original ovation hard shell case as well.. The electronics sound superb and I really like the low action and shallow body since I have a bit of a gut. Well a third new guitar just got added. " Ah a Jeffrey Phillip Wielandt Model! " our local guitar tech called it. Some numb nuts painted the bottom back of the neck about 3 inches up in bright white to form a ^ upwards point to match the downwards point at the bottom of the rear of the head stock. Did a sloppy job too. That put a good dent in the value of this one. 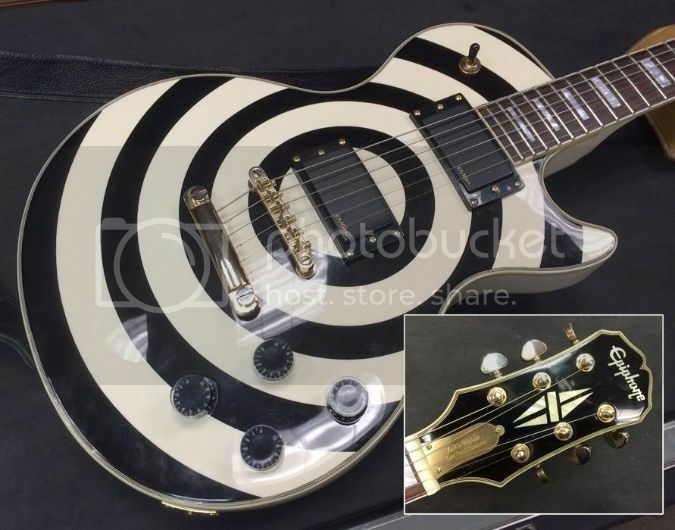 I've got it at our local guitar tech's shop to fix the finish back on the neck back to stock and give it a set-up. For some reason the action was way high and intonation was off on a string or two. I couldn't get it to fret out or buzz on any fret so I'm not sure why it was set so high. 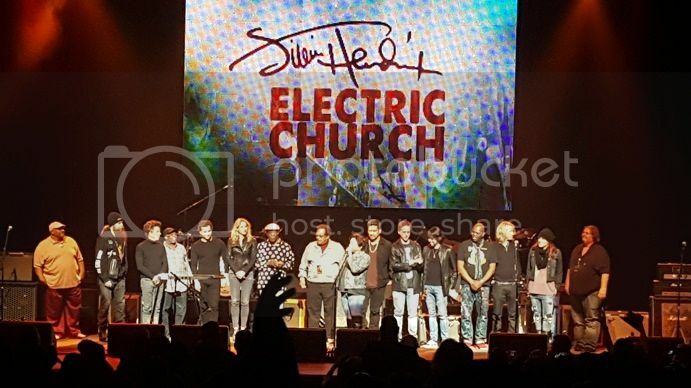 I've never been a Les Paul type of guitar fan. Weight and rounded necks, nah keep em. Maybe my taste is changing, but this one didn't feel to bad in the hands and sounded incredible. Sustain for days as well. It's just an Epiphone, but it's definitely made an impact on how I feel about Les Paul style guitars. Needle in a hay stack? Seems like everyone has had or still makes their own version of the LP from Ibanez to Washburn and most manufactures in between. Yahoo. Just scored a excellent JEM90HAM. The big brown truck will be delivering this one in a day or two. Original case with all cards, cert etc. included. 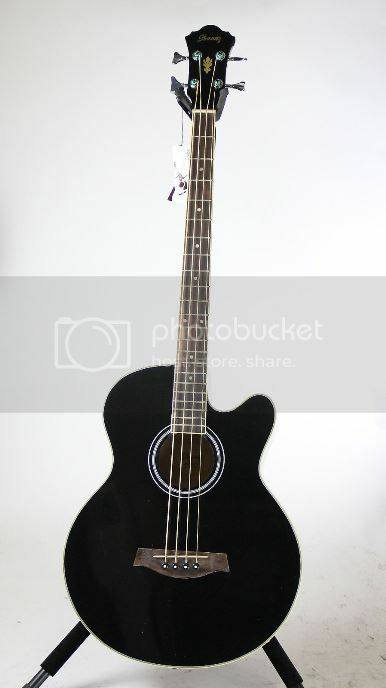 Can't wait to strum this one and check the set-up. 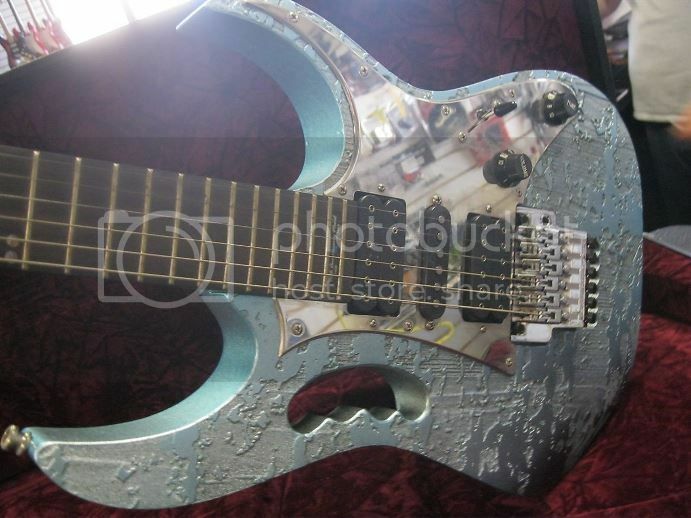 Then wipe it down and just hang it up I suppose..
Not my photo, but it's of the actual guitar I bought. Bad sunlight glare.. errr. Well, I did it again. Grabbed a JS1000. Only issues were a stripped screw hole in the locking nut bracket and that it was in dire need of a proper setup. Plays smooth now and quite bright for passive pickups. Here it is at our local tech's shop waiting on the new nut bracket part. Well I couldn't pass these up either.. A two fer on a Sunday morning stroll through GC this past weekend. 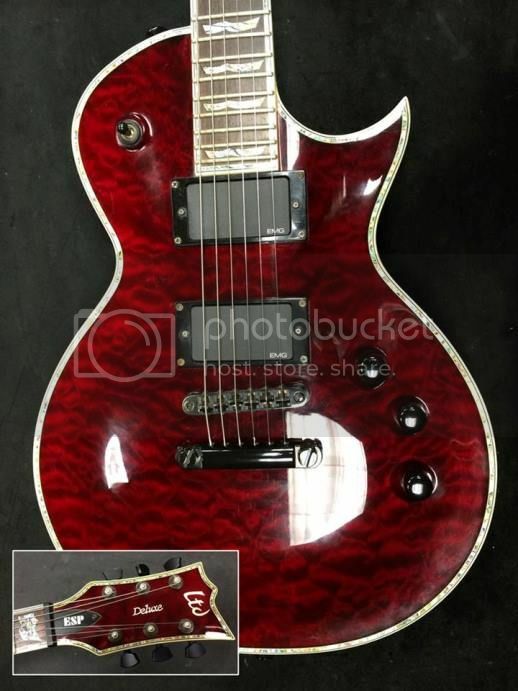 The Black Cherry ESP LTD EC-1000 is just one eye catching guitar in person. The photo doesn't do the finish, binding & inlays proper justice. This one is a 2003 which was the first year ESP produced these. Then I also grabbed this one. Inexpensive, but plays very well. Electronics sound great too. Nice deep tones..